Replaces the default Bethesda intro with a sexier intro! Fully supports 1920x1080 screen resolution! 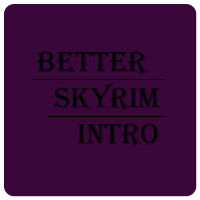 Better_Skyrim_Intro_recoded This provides NMM support and I highly recommend using it. Added a UHQ LOUD version, which is as VERY loud! Fully supports 1920x1080 screen resolution. THE LQ, HQ AND 'UHQ LOUD' VERSIONS OF THIS MOD ARE EXTREMELY LOUD! I HIGHLY RECCOMEND THE UHQ FILE, AS IT IS AT A NORMAL VOLUME! 'Bethesda Logo' show when the game is booted up. About 30 minutes ago I decided to change that. So, I strode through the bowels of You-Tube to find the 'Live Action Skyrim' commercial, chopped it down with pinpoint precision, and consumed all of my magicka converting it in a '.bik' file. I searched for the correct folder, shoved it in with all my might, consuming all of my stamina in the process, and managed to facilitate this work onto the Nexus! I hope you all enjoy! Thanks! 5. Enjoy the sexier intro! 3. Enjoy the sexier intro and the simplicity of the Mod Manager! 1. Double-click the mod in the Nexus Mod Manager to disable it, or click it once and then click the red 'X' button on the right, deleting the mod permanently.